One major shortcoming of existing bi-scale material design systems is the lack of support for inverse design: there is no way to directly edit the large-scale appearance and then rapidly solve for the small-scale details that approximate that look. Prior work is either too slow to provide quick feedback, or limited in the types of small-scale details that can be handled. We present a novel computational framework for inverse bi-scale material design. The key idea is to convert the challenging inverse appearance computation into efficient search in two precomputed large libraries: one including a wide range of measured and analytical materials, and the other procedurally generated and height-map-based geometries. 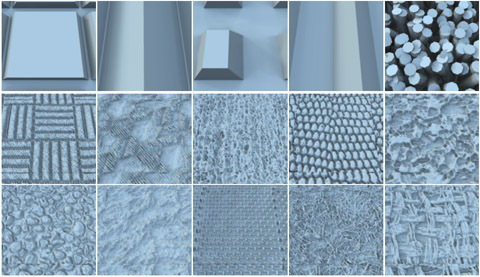 We demonstrate a variety of editing operations, including finding visually equivalent details that produce similar large-scale appearance, which can be useful in applications such as physical fabrication of materials. We now make public a database of height-maps, which are used to populate our small-scale geometry library. The database consists of a wide variety (total number 33K) of gray-scale image patches of 128x128, whose low-frequency signals are removed to make it more suitable as a tilable structure. These images can be directly converted to 3D geometries, by applying different amplitudes. We hope that our height-map database could be useful to both computer graphics and computer vision research, where a large number of small-scale geometries are needed. The database is free for academic use. The only requirement we ask is to cite the Inverse Bi-scale Material Design paper in your publication that uses our data. Please email me using a title that starts with "[Height-map Database]" to apply for downloading the database. In the email, it would be good to include your name, affiliation and a rough plan about how to use the database.